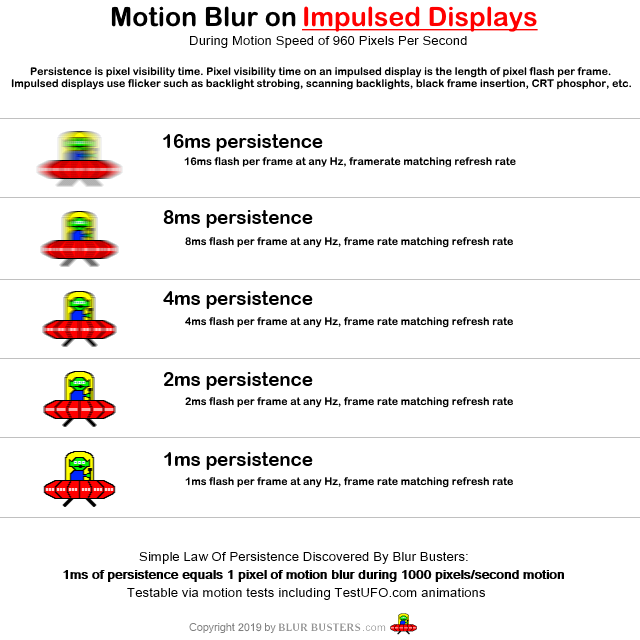 Blur Busters Forums • View topic - Sensitivity to PWM = sensitivity to DyAc? Sensitivity to PWM = sensitivity to DyAc? Would I be able to use monitors with DyAc enabled? Or would they give me the same symptoms? Re: Sensitivity to PWM = sensitivity to DyAc? Anecdotally over the years, with many coming to us about display ergonomic quirks, it's a more complicated question than expected. It depends on if your PWM sensitivity is from PWM artifacts or from PWM flicker itself. That's the direct sensitivity to flicker itself. Strobe-based blur reduction will probably bother you. Also often the same kind of sensitivity to stroboscopic artifacts from PWM lamp dimming (e.g. LED bulbs that flicker). Strobe-based blur reduction avoid these artifacts for eye-tracking situations, as one-PWM-pulse-per-refresh. So you might have less strain from this, and even tolerate it. Motion blur reduction can be a more eye-friendly PWM but it won't be friendly to everyone who has a PWM sensitivity. Unfortunately there's no way to easily tell if motion blur reduction will help or hurt your eyes. but the good news is that display motion blur reduction is a feature that can be toggled ON/OFF. Another way to reduce motion blur is simply sheer Hz (flickerfree). The use of flickerfree 240fps at 240Hz has one-quarter the display motion blur of flickerfree 60fps at 60Hz. (This is known as motion blur from the sample-and-hold effect). So what's confusing to me is that I wasn't ever sensitive to CRT flicker, and I'm not sensitive to plasma TV flicker. But something about certain implementations of PWM gives me crazy headaches almost immediately, even with no moving content. Chief Blur Buster wrote: Anecdotally over the years, with many coming to us about display ergonomic quirks, it's a more complicated question than expected. It depends on if your PWM sensitivity is from PWM artifacts or from PWM flicker itself. If I am not sensitive to LED Clear Motion on a samsung TV, would I be sensitive to DyAc? blurbustingbunny wrote: If I am not sensitive to LED Clear Motion on a samsung TV, would I be sensitive to DyAc? If your eyes tolerates LED Clear Motion on a Samsung TV, then probably not. Samsung LED Clear Motion is a strobe-based motion blur reduction (blur reduction strobe backlights are "1-pulse precision PWM"). 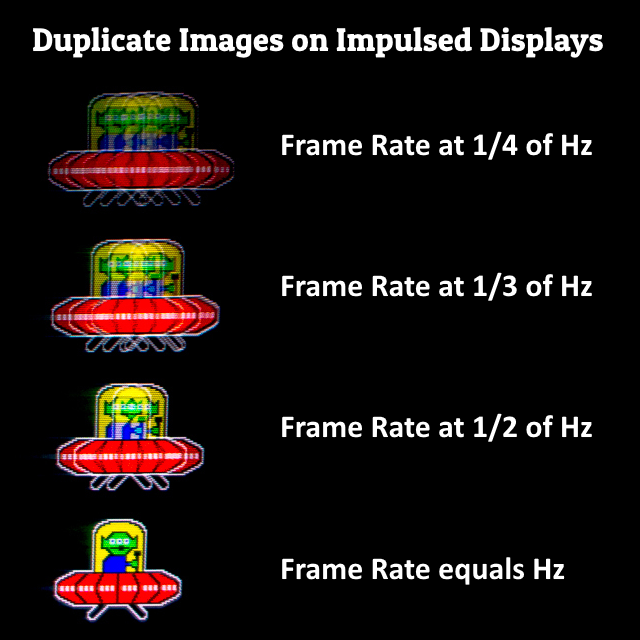 To avoid duplicate-image-related eyestrain, remember to have framerate = refreshrate = stroberate. So as a rule of thumb, increase GPU power, lower refresh rate, until your frame rates match your strobed refresh rate, and you've got motion nirvana. The XL2546 is extremely bright, and you sit much closer than with a television. - Adjust brightness of strobe (or shorten strobe length / lower persistence in Strobe Utility) so it's not too bright. - If you get eyestrain, try dimming brightness even further and use low-blue-light mode. (To cover the potential "red herring" or "wild goose chase" effect: if your eyestrain was unknowingly actually caused by excess blue light rather than from the flicker). Okay interesting. I'll try playing on the Samsung TV first and see how it goes. Motion blur reduction modes use a strobe backlight technique (More info in Motion Blur Reduction FAQ. Strobe backlight based motion blur reduction usually dramatically dim their displays, sometimes to below 100cd/m2, because of the bright:dark ratio. Doing 1ms MPRT(100%) means the backlight is ON for 1ms and OFF for the rest of the refresh cycle. For 120Hz (8.33ms), that is quite a dramatic (1/8.33)th the original brightness -- 88% drop in brightness, unless using voltage-boosted strobe backlight flashes. So a strobe backlight capable of keeping effective average brightness >300cd/m2 is plenty bright while simultaneously eliminating 80-90% of motion blur. The amount of motion blur reduction is directly proportional to the pulse relative to refresh cycle. So 1ms/8.3ms for a 1ms flash at 120Hz, reduces display motion blur by 88%. Strobe backlight modes typically achieve the bottom-most UFO in motion clarity seen at http://www.testufo.com in full motion at 960 pixels/second, for framerate-refreshrate matched motion.